New to me, not digested, not taken under my skin, but without any shadow of a doubt good music from John Clyde-Evans' (ex-HOOD) alter-ego. About: "Debut album from the duo of Richard Youngs and Tirath Singh Nirmala (nee John Clyde-Evans) that has the pair creating a bucolic minimalist meditation. Side one interchangeably features hammered strings, gong/cymbal washes, droning vocals, and breathed shackuhachi/flutes. The second side leads with a melodious encounter before delving further into a glimmering psychedelia with sawed strings, fluttering reed organ and electronic drift. The results resemble a non-western approach to traditional musics filtered through the personalized aesthetic that runs through each of the artist's prior works. 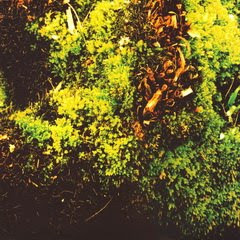 The LP is enclosed in a full colour cover with suitable "of the earth" imagery." BRAD ROSE: The last collaborator of yours I want to talk about (I swear I won't bring any more up!) is Tirath Singh Nirmala, of whom I'm a great admirer. I know you all have an LP coming on HP Cycle, and you've both played with Neil Campbell as part of Astral Social Club. How'd you and Tirath meet? RICHARD YOUNGS: We've known each other for years, through Neil. His early John Clyde-Evans lp is one of the few experimental records I return to, and when he started churning out those cdrs, the time seemed right to record together, something we had never managed to do up until then.